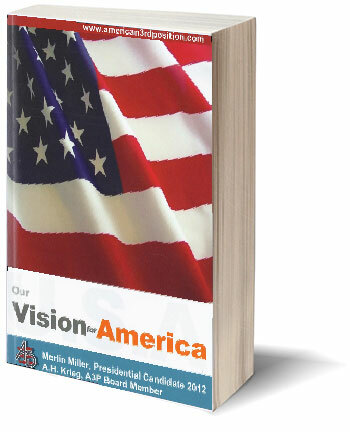 This book by Merlin Miller presidential Candidate 2012 of American Third Position Party and A. H. Krieg a board member of A3P is the party Platform of A3P for the presently running 2012 presidential campaign. The book deals in detail with the problems that America faces and how they can effectively be dealt with. It is about current events, politics, economics, energy production, and executive polices of A3P. Solutions for all problems are explained in detail. The failure of the Republocrat system in the last seven years is detailed and why Americans should join A3P and vote for A3P polices and candidates is clarified.